Be My Chum! is a 1-vs.-3 microphone minigame in Mario Party 7. The solo player can call out commands by speaking into the microphone. The Commands are: Cheep Cheep, Sushi, Blooper, and Lakitu (Lakitus will drop Spinies). If the solo player says "Goomba", a Goomba in the background will jump, but this does not affect gameplay. 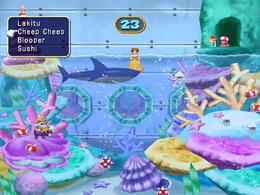 The other three players swim around in the water, using the to avoid the attacks. For the solo player to be victorious, they must use the commands and eliminate the other three players. For the three players to win, they must hold out for 30 seconds. Mic – Say: "Cheep Cheep", "Lakitu", "Blooper", "Sushi"
Rules – "Use the Mic to attack the underwater swimmers. If you're in the water, dodge everything!" Advice – "If you're swimming, keep a close eye on the Cheep Cheeps! They're tricky!" This page was last edited on November 1, 2018, at 20:13.